For visitors' information, go to The Friends of Margaretsville Lighthouse Society on Facebook. 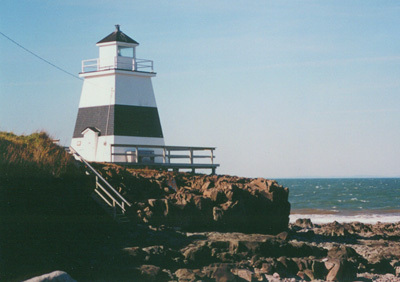 The lighthouse is a 22 foot high tapered square wood tower painted white with black bands. The white light is shown 30 feet above the water. ACKNOWLEDGEMENT: Contributor: Kathy Brown. Sources: Viva Moody from The Mirror, courtesy of Mailman Publishing, NSLPS Database. The Margaretville lighthouse was built when the residents of the thriving village of Margaretsville decided in 1859 that a lighthouse was a necessity to navigation for vessels plying the water of the Bay of Fundy in ever increasing numbers. A deed was drawn up between Sir Brenton Haliburton, Knight, Chief Justice of the Province of Nova Scotia, and Stephen S. Thorne, Chairman, George P. Mitchell and Andrew McKinley, Commissioners of Public Property on the other, and whereas said Legislation made appropriation for the erection of a public lighthouse or beacon light at or near Margaretsville... and the said commissioners accept all that certain land situated at Margaretsville, Wilmot, and being a portion of land originally laid out as a shipyard. The deed was signed by Brenton Haliburton on June 7, 1859. At the time that this deed was written, Sir Brenton Haliburton still owned a part of the land which is now Margaretsville. Originally, the land grant had been made out to Sir Brenton's father, Dr. John Haliburton, surgeon from Rhode Island, for his service in His Majesty's Royal Navy. 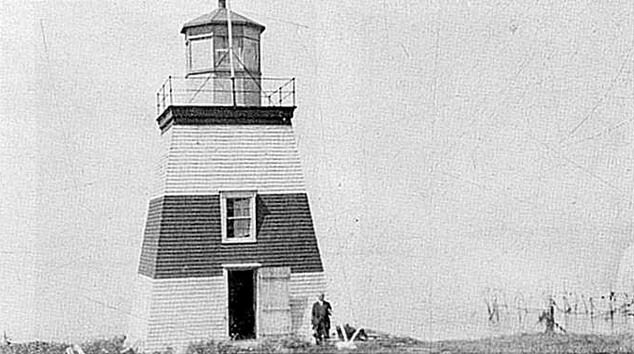 When the Margaretsville lighthouse was erected it was one of the first along the Nova Scotia side of the Bay of Fundy. Before that time there were only about half a dozen lighthouses in operation on the Bay. But the year 1859 seemed to be a good one for lighthouse building as there were several more built at about this period. The light was powered by a kerosene lamp. According to the diary of one of the lightkeepers, Joseph Cleveland, the amount of kerosene used during light summer months was about 7 gallons. During the winter dark days about 12 gallons were consumed on average, per month. Lights were lit just before sunset and extinguished at dawn. Before the new lantern was installed in 1911, the light was powered by 8 large red lamps with brass reflectors. These had to be cleaned and polished each day and filled with oil. The first keeper of the Margaretsville light was William Earley, 1859-1887. A native of the North of Ireland, he acted as steward for Sir Brenton Haliburton. William Earley lived on the property which belonged to the family of Lemuel Mapplebeck. It was a long journey for William from his home to the lighthouse in those days before modern transport. John Earley succeeded his father as lightkeeper, holding the office from 1887 to 1907. While John was incumbent, the second floor of the light was converted to living quarters, where he stayed during bad weather. After John Earley's death, his widow, Mrs. Ruth Earley, became keeper from 1907 to 1910. She had the distinction of being the only women to actually be a keeper of the lighthouse. It was during her term that the old lantern, was removed and replaced with a new cast iron top which is the same one that is presently in use. A story recounted by old timers about the lighthouse tells of a keeper who would take off his cap each evening as he entered the lighthouse, and with a deep bow, say "Good evening, Dave". They believe he was addressing the apparition of a man who had jumped from the wharf at high tide. Afterwards, his body was brought to the lighthouse and laid there overnight before being hurried outside to a cemetery to be buried in an unmarked grave. Nearby the light is a cliff known as Peter's Point, where wrecker Peter Barnes fell to his death 20 years after he had lured a schooner to her tragic end at that very spot. In 1859, William Earley supervised the construction of the Margaretsville Lighthouse, built by Sir Brenton Haliburton. The guiding light was installed in the following October and William became the first lightkeeper. 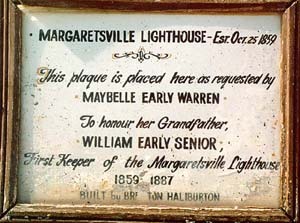 Through the endeavours of Viva Moody of Margaretsville and Mrs. Maybelle Earley Warren of the USA, in 1985, the Canadian Coast Guard had a plaque installed on the lighthouse commemorating William's tenure as lightkeeper. Margaretsville Lighthouse still serves mariners on the Bay of Fundy. 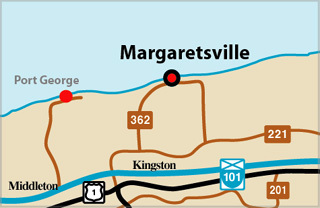 It is now part of a redevelopment on the Margaretsville waterfront.